Hideo Kojima says his latest Metal Gear title is similar to Nintendo's cute creature battler. The Metal Gear series - with its lengthy cutscenes, strange bosses, and stealth-emphasized gameplay - could be compared to many other videogame franchises. Would you believe that Hideo Kojima, the brains behind Metal Gear, believes that one of those is PokÃ©mon? Kojima is promoting the PSP's upcoming Metal Gear Solid: Peace Walker as a completely new entry in the series. "You won't 'get' it until you play it," he says. "It's part MGS, part Monster Hunter and part PokÃ©mon - and it's even got a bit of SimCity to it." Kojima feels Peace Walker is "like no game before." Okay, so... wait did he say PokÃ©mon? PokÃ©mon is an RPG-like series about capturing creatures to make them battle against each other so you can catch even more of those creatures. One might say it's about "catching them all," which is a term I've recently coined. Is it possible that Metal Gear could somehow be similar? To elaborate, Kojima said that Metal Gear has been about "tactical espionage action" in the past, but that Peace Walker is about "tactical espionage operation." There is a "nuance of running and maintaining Big Boss' army while handling sneaking missions," he explained. 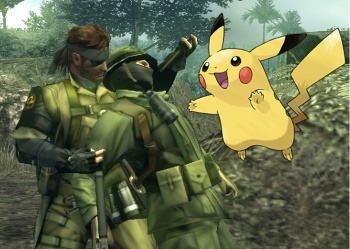 So, it appears that the army is in effect the player's arsenal of PokÃ©mon in Peace Walker, and Big Boss won't be trying to catch cute lizards to evolve them into Charizard. Despite Kojima's lengthy tour in the videogame development business, he revealed that he's "never experienced a game production like [Peace Walker] before in [his] career," and that "nearly everything you can do with a portable system is in this game." I think he wants people to get interested in Peace Walker even though it's on the PSP, expressing that the handheld can still produce a fun and new experience. For those who want to see if their army can be the very best, Metal Gear Solid: Peace Walker will be released in North America on June 8, and in Europe on June 17.